The adaption to the target is a 22 pin Samtec connector (Power.ORG pinout). Connect the two latch pins to GND. Signals in brackets are reserved for future use. The target connects both trace and debug signals to the Samtec connector. 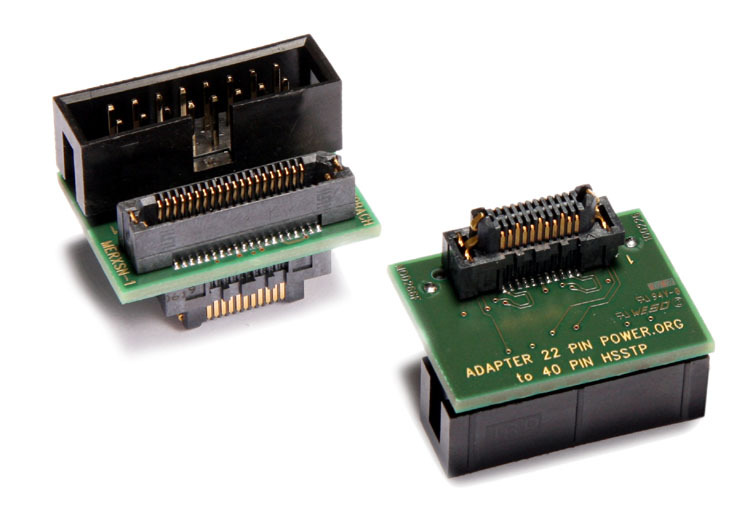 As the adapter includes a 16-pin COP header for the debug cable, it can be used for debugging/tracing as well as for JTAG-only debugging. The target has separate connectors for tracing (Samtec22) and debugging (16-pin COP header). The target has separate connectors for tracing and debugging, but the debug signals are connected to both connectors. This solution is often found on evaluation boards because of it's flexibility, but in terms of JTAG signal integrity it is not recommended. JTAG-VREF, TCK, TMS, TRST-, TDI, TDO, RESET-.